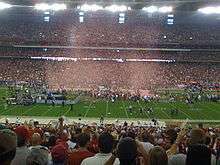 The 2008 Arizona Cardinals season was the 89th season for the team in the National Football League and their 21st season in Arizona. The season marked the Cardinals' first-ever Super Bowl appearance, coming as a result of their victory against the Philadelphia Eagles in the NFC Championship. The Cardinals slogan for the season was "Shock The World!". The Cardinals began their season by compiling a 7–3 record by Week 11 and finished the regular season with a 9–7 record, which was good enough to win the NFC West, and the Cardinals, for the first time since 1947, hosted a playoff game. In that wild card game, the Cardinals defeated the Atlanta Falcons. The next week, for the Divisional round of the playoffs, the Cardinals traveled to Charlotte, North Carolina, where they upset the number 2 seeded Carolina Panthers. Then, because the Philadelphia Eagles also achieved an upset the same week (against the top-seeded New York Giants), the number-four seed Cardinals hosted the NFC Championship game, where they defeated the Eagles and qualified for the Super Bowl. In Super Bowl XLIII, the Cardinals' winning streak ended. Though they led the Pittsburgh Steelers with less than a minute left to play in the game, they lost, 27–23. Coming off their divisional road win over the 49ers, the Cardinals played their Week 2 home opener against the Miami Dolphins. In the first quarter, the Cardinals scored first as QB Kurt Warner threw 2 TD passes (a 79-yarder and a three-yarder) to WR Anquan Boldin. In the second quarter, Arizona increased their lead with a 45-yard field goal by Neil Rackers. In the third quarter, the Cardinals increased its lead to 24–0 with rookie RB Tim Hightower getting a one-yard TD run. In the process, he became the first Cardinals rookie running back to ever score in each of his first two games. The Dolphins finally got on the board when kicker Dan Carpenter nailed a 32-yard field goal. The Cardinals replied with Warner and Boldin hooking up with each other for a third time on an eight-yard TD pass. In the fourth quarter, Miami tried to rally as RB Ronnie Brown got a one-yard TD run, but Arizona held on for a dominating win. Coming off their home win over the Dolphins, the Cardinals flew to FedEx Field for a Week 3 duel with the Washington Redskins. In the first quarter, Arizona trailed early as Redskins RB Clinton Portis got a three-yard TD run. In the second quarter, the Cardinals continued to trail as kicker Shaun Suisham got a 48-yard field goal. The Cardinals would end the half with QB Kurt Warner completing a four-yard TD pass to WR Anquan Boldin. In the third quarter, the Cardinals tied the game with kicker Neil Rackers nailing a 26-yard field goal, yet Washington responded with QB Jason Campbell completing a two-yard TD pass to TE Todd Yoder. Afterwards, Arizona answered with Warner completing a 62-yard TD pass to WR Larry Fitzgerald. However, in the fourth quarter, the Redskins pulled away with Campbell's 17-yard TD pass to WR Santana Moss. Arizona would trail early in the first quarter as Panthers running back Jonathan Stewart got a nine-yard touchdown run. The Cardinals would respond with quarterback Kurt Warner completing a three-yard touchdown pass to rookie running back Tim Hightower, followed by running back Edgerrin James' four-yard touchdown run. In the second quarter, Arizona took control as kicker Neil Rackers got a 49-yard and a 30-yard field goal, followed by Warner's 29-yard touchdown pass to wide receiver Larry Fitzgerald. Two weeks following their NFC Championship victory over the Eagles, the Cardinals flew to Raymond James Stadium for their Super Bowl XLIII duel with the AFC Champion Pittsburgh Steelers. Arizona would trail early in the first quarter as Steelers kicker Jeff Reed got an 18-yard field goal. The Steelers would add onto their lead as running back Gary Russell got a one-yard touchdown run. The Cardinals would answer with quarterback Kurt Warner completing a one-yard touchdown pass to tight end Ben Patrick. Arizona came close to scoring again nearing the end of the half, but Pittsburgh linebacker James Harrison returned an interception 100 yards for a touchdown.